The Southern Cross is our main directional marker in the Southern Hemisphere. The Northern Hemisphere is especially gifted in that the North Star lies within one degree of the celestial north pole--that spot in the northern skies around which all stars turn. There is no such pole star in the South. But not to worry. The Southern Cross may not be located at the earth's celestial south pole, but it effectively points the way to it. To find south by the Southern Cross, simply extend a line in your mind's eye out from the foot of the cross and in line with the long axis of the cross. Make this line about four and a half times the cross's length. This line ends at the south celestial pole--that spot in the southern skies around which all the stars turn. Once you've found the celestial pole, to find south along the horizon, simply extend a line in your mind's eye from the south celestial pole straight down to the horizon. 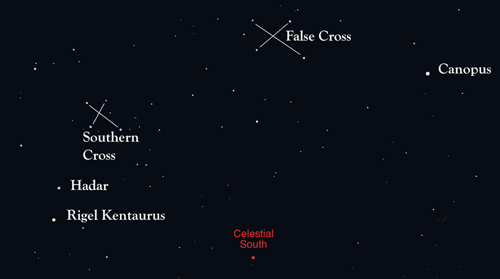 One star grouping in the Southern Hemisphere that might mislead you is the False Cross, which is a group of four fairly prominent stars that also resemble a cross. 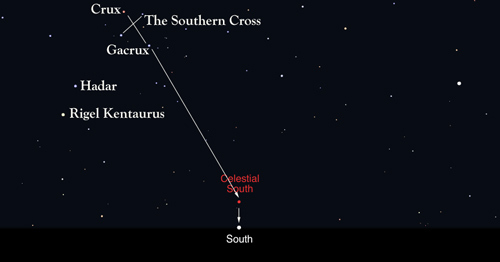 The False Cross is located much closer to the bright southern star Canopus than is the Southern Cross. When looking for the true Southern Cross, you'll know you've found the real deal when you see nearby two bright trailing stars known as Hadar and Rigel Kentaurus.